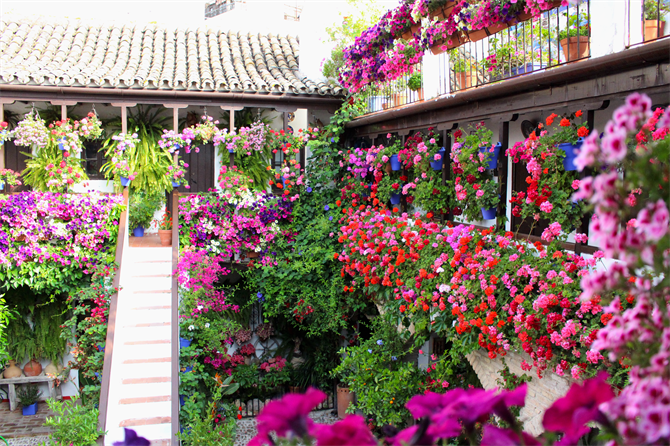 The Cordoba Patios Festival takes place every year during the first week of May and is a long standing tradition of the city of Cordoba. 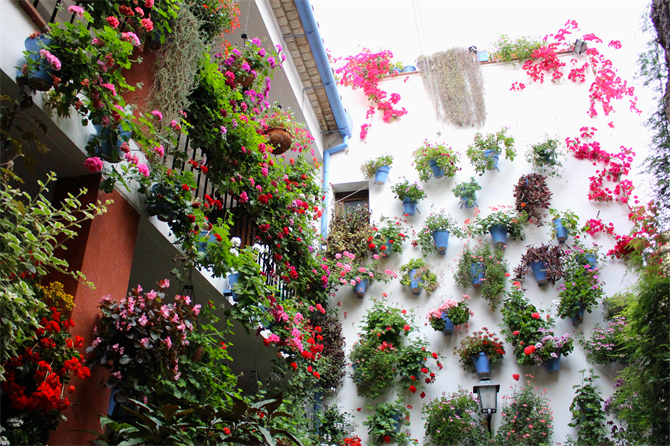 “Patios” translates to “courtyards” and the festival celebrates the art of elaborately decorating courtyards with hundreds of colourful flowers and plants. 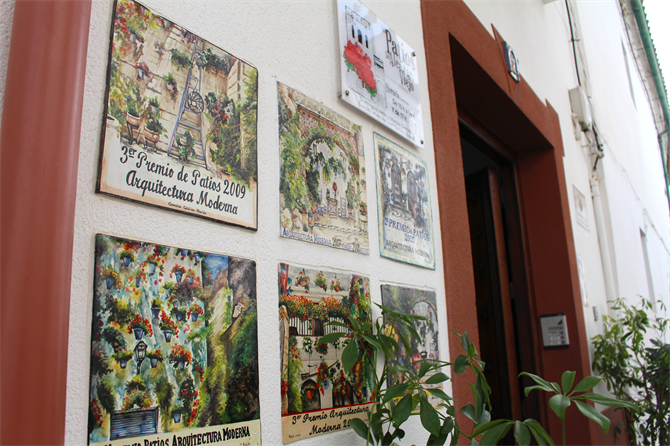 Since the first patios event in 1918, the Cordobeses have been cultivating and caring for their patios every day. 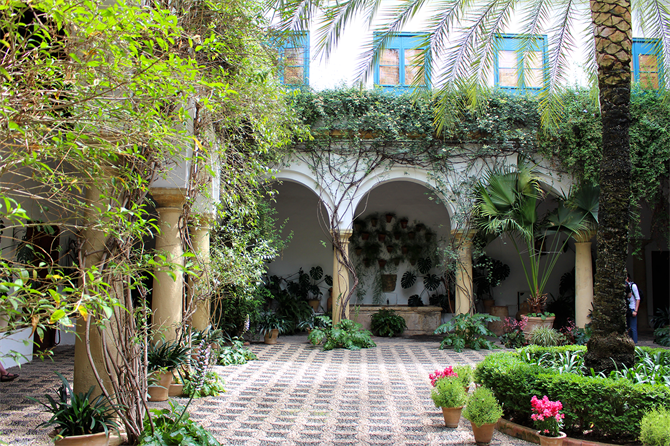 These secret courtyards are privately owned, hidden behind the homes, doors and walls of the city, but for one week of the year they are opened to the public, who can come and enjoy the beauty of the flowers, plants and architecture. The opening hours of the festival tend to stay the same every year, for the week of the festival the patios are open from 11am to 2pm and from 6pm to 10pm every day. All patios are free to enter but small donations are appreciated by the hardworking owners, who put it towards the upkeep of the patios. 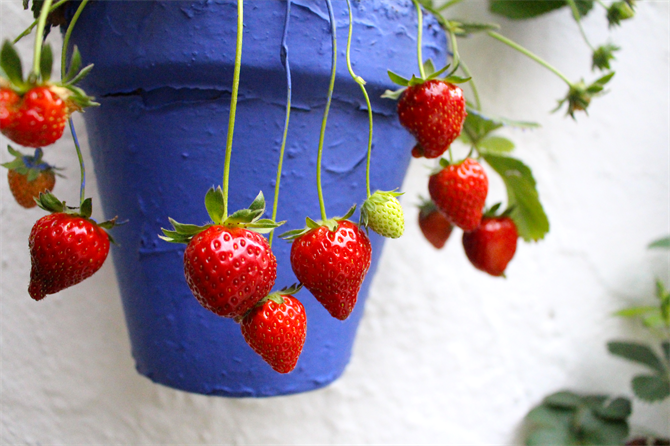 What are the best routes for The Cordoba Patios Festival? 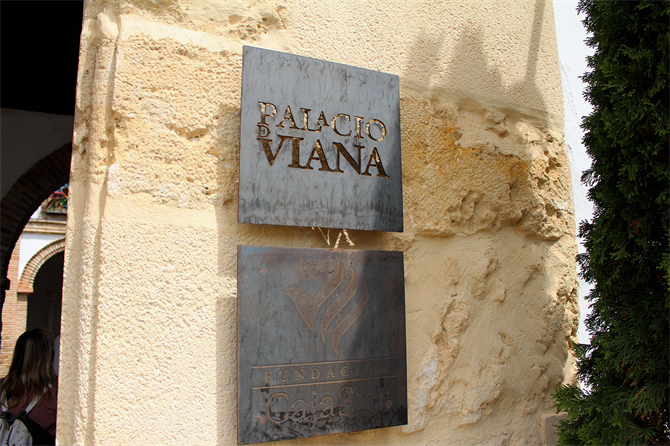 A great place to start a route through the patios is at the Palacio de Viana - a 15th century manor house surrounded by 12 beautiful courtyards, situated in the Santa Marina neighbourhood. The San Basilio or “Alcazar Viejo” neighbourhood and the Juderia neighbourhood or “Old Jewish Quarter” are also ideal spots to start a route through the city. The amount of patios change each year and thus, the routes do as well. You can find an interactive map with all the suggested routes on the Puerta de los Patios website or download the app to your phone or tablet from the app store. This website is updated every year with the new routes and all open patios, so it’s accurate and a great tool to have in your pocket during a day enjoying the patios. 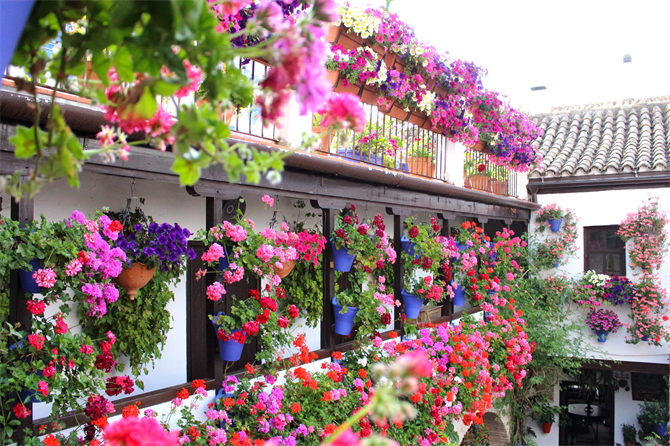 What is The Cordoba Patios Festival? The Cordoba Patios Festival is known in Spanish as “La Fiesta de los Patios Cordobeses” or simply “Los Patios de Cordoba” and is Cordoba’s most anticipated yearly event. For 13 days in May, the Cordobeses throw open the gates and doors to their private patios and reveal the secret floral delights within. 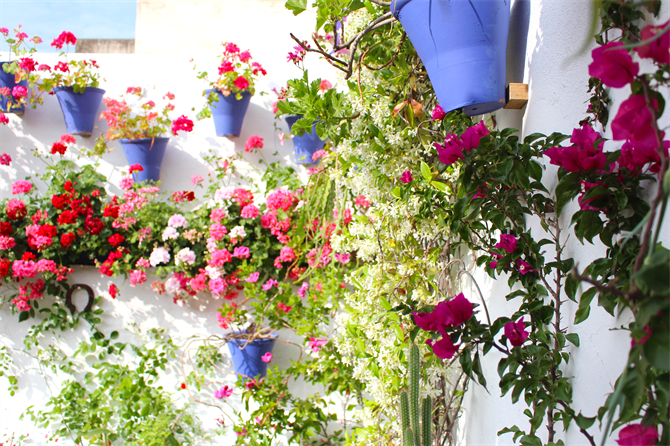 The patios are a floral paradise, each space is filled with plant pots of brown, blue or green overflowing with flowers of all colours, shapes and sizes. Lush green leaves are accented with explosions of vivid pinks, bright reds, dark purples, burnt oranges and delicate pastel shades. 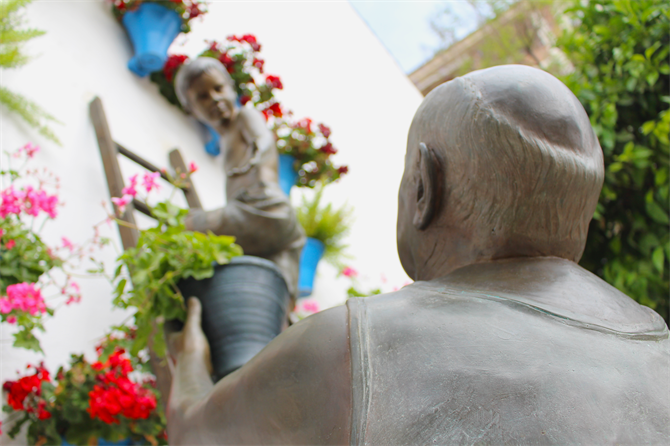 The patios are also filled with eclectic ornaments and decorative elements like small water features, antique gardening tools, artwork and shrines to San Raphael - the Patron Saint of the Patios. 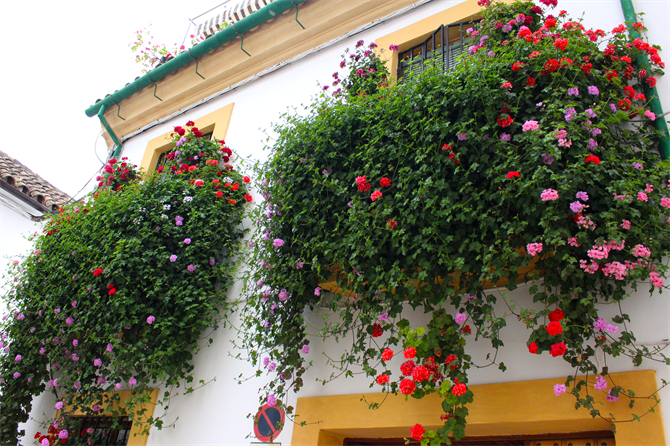 The Patios of Cordoba tradition dates back to Roman times. Located in a part of the country where temperatures are extreme, the Patios required constant care and attention all year round. This was no small feat considering that in Cordoba, daytime temperatures often surpass 40°C in the summer months and night time frosts are not uncommon. To compensate for this harsh climate, the Romans and then later on the Muslims built their houses in a particular way, incorporating courtyards into the centre of the building complex. These courtyards were cool, shaded inner spaces where families congregated to escape the summer heat and collect any rainwater that fell. The Muslims, however, are the ones that really took creating relaxing patios and inner spaces to a whole new level. They are credited with introducing water features and plants into the patios, with the purpose of increasing the sense of freshness and tranquillity. Interestingly, this actually works very well and temperatures inside some patios are said to be between 10°C - 15°C cooler than the street outside the house, a huge difference in the summer months. The Muslims also put a lot more emphasis on the social element. They believed that a patio should not just be a place of a beauty and tranquillity, but also a place for people to meet and socialise. The Patios Festival was first organised by Cordoba City Hall in 1918, with the first competition taking place in 1921. The competitive aspect was implemented as an incentive to preserve the tradition, which over the years was financed to assist participants with expenses and ensure that the tradition didn't die. The Patios Festival was suspended for three years during the Spanish Civil War, but has been going strong ever since. Two awards are given for the most beautifully floral and best architecturally preserved patios. One is for “arquitectura antigua” or antique architecture and the other for “arquitectura moderna” or modern architecture. Throughout the duration of the festival, most of the patios are filled with the sounds of music from traditional flamenco performances, there’s also a variety of wines and tapas on offer for visitors to enjoy. Cordoba in May attracts some of the biggest names in Flamenco, with impromptu concerts and street parties on almost every corner. There are a number of tour operators who offer guided tours outside of the opening times and dates of the Patios Festival. There's also a selection of tours to choose from depending on your budget, time frame and the size of your group. The majority of tours last around two hours and take place in the months of March until June. Prices vary slightly depending on the tour operator that you choose but typically, prices range between 10€ and 20€ for adults and under 10€ for children. There are also free walking tours for those on a tighter budget, which usually meet around 10:30am in a central spot, so there's options available for everyone during a holiday in Cordoba. 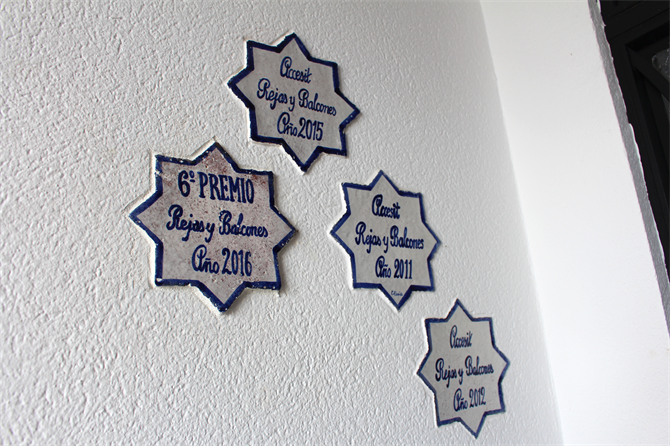 Depending on the tour route you choose, you will also see various neighbourhoods in the city as well as the patios, like the Jewish Quarter and the Alcazar Viejo. The Cordoba Patios Festival was added to UNESCO’s list of World Intangible Cultural Heritage sites in 2012 and was followed by the Valencia Fallas Festival in 2016. Spain has a total of 45 UNESCO World Heritage sites and 16 cultural practices on the UNESCO list of Intangible Cultural Heritage. 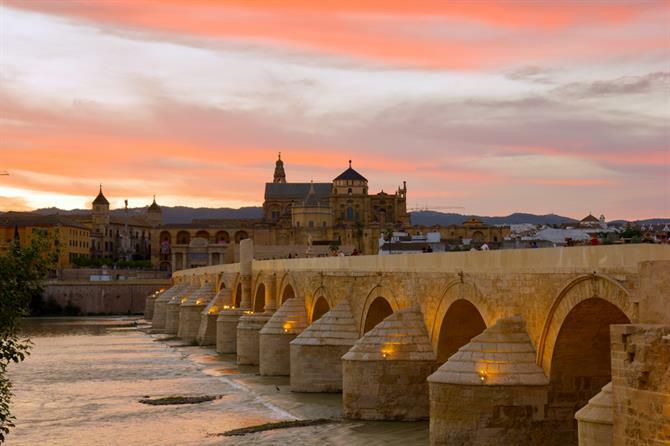 Cordoba’s old town, including the Mezquita, is the world's largest urban area declared as a UNESCO World Heritage site. This is followed closely by the Patios Festival - the most anticipated event on the calendar. The celebrations are finished off with the Feria de Cordoba (The Cordoba Fair) with visitors and locals alike dancing the nights away to traditional flamenco music and enjoying the party atmosphere. There is no better way to welcome Spring than with flowers, aromas, lights and life! 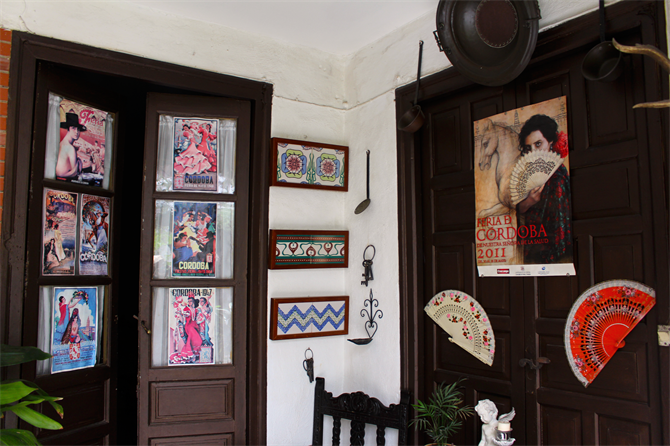 Do you want to explore Cordoba during your city break? Let our themed walking routes guide your through this Andalusian gem! The Alcazar: Roman Fortress, Moorish palace, Christian castle. What makes this diverse building so special?